Technology is increasing at an unprecedented rate. It is widely accepted that this will only speed up exponentially as advanced technology has the ability to create new technology quicker. The benefits of this are outstanding; people are living longer and with more opportunities. This does however, all comes along with some extremely pressing issues. Historically, it has been easy to keep on top of the latest developments in society, in cultural, technological and economic domains. The speed and complexity of the current technological wave is creating a huge lag and level of difficulty regards to keeping on top of regulation. As the Internet of Things (IOT) grows and anything and everything becomes equipped with data collecting sensors, devices and the organizations behind them are getting new insight into our personal lives. The last couple of years have seen the true first emergence of smart home tech on a mass scale. The top selling smart hubs, such as the likes of Amazon’s Echo and Googles Home, are now selling in excess of 10 million units per year. We are only in the early days of the smart home trend and a wide range of issues has already been highlighted and raised considerable concern. This article will explore the gravest concerns of privacy and other issues related to the smart home trend that regulation needs to catch up with. Smart devices gather a multitude of data types via their sensors. The smart home principal is of course based on the user’s home, which is by nature the most private space. The consequence of this is that devices in the smart home ecosystem will gather information about users in their most casual and private setting. This is considered highly sensitive data, which has the exploitative potential. Now this would all be fine if tech manufacturers respected their limits and recorded only the data that they is relevant to them. The problem is, as highlighted by this Which? Article, is that tech firms are taking advantage over having their sensor-integrated devices in consumers homes and recording data and information on the individuals that is of no relevance. The findings of the report are quite worrying and indicate an infringement on privacy. The UK magazine tested 19 different products to test a full spectrum of device types. One example was a smart tv which was used for just 15 minutes. During the time, it was on it connected with 700 unique IP addresses, which is highly suspicious. Another example was the Philips Sonicare Bluetooth electric toothbrush, which previously required your location and very bizarrely asks to record audio. A more disturbing fact was the devices were sending information to 20 operators in total behind the scenes, including marketing companies. This confirms what we fear will be done with our data. This highlights the issue of both the speed that devices get rolled out and the complexity and variety of ways the data can be gathered. If a toothbrush wants to listen to you then surely your Amazon’s Echo does, even when it’s off. Privacy exploitation seems to be the most pressing issue of smart home tech. The internet takes out much of human connection and ethics when it is used. It is a detaching medium and this effect applies to both the everyday individual users as well as commercial entities. There is a huge grey area between a private and public space in the online world. These facts are amounting to the rise of privacy concerns and rightly so. Smart home tech is seemingly the most potent driver out of all the tech trends to the rising worries of such concerns, and this will be due to the sensitive nature as mentioned. Technology will not stop developing and consumers want the newest and best products continually. The answer is therefore not to block devices but for manufacturers to build trust with their customers. Another worrying issue with smart home technology, which rather surprisingly appeared, was its exploitation in domestic abuse cases. Research at the University College London explores how these devices can and are being used in domestic abuse cases. For one, a regular theme of domestic abuse is monitoring the movement by a partner. 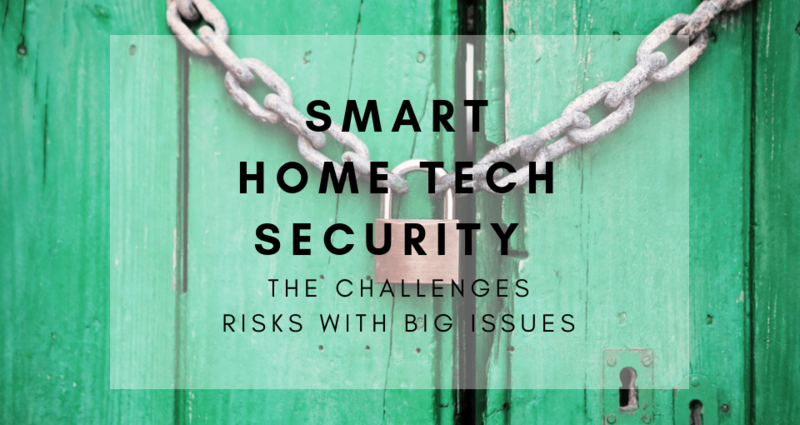 Smart home security devices, such as cameras, are accessible at any time and anywhere. Partners can receive live notifications based on motion and audio detection, adding greater monitoring to any movement by their spouse. A fact which makes this more complicated is that in the vast majority of cases, the smart home tech is purchased and installed by the man of the relationship. They are statistically the more common perpetrators of domestic abuse. As well as the more obvious monitoring and surveillance issue, one partner to cause panic and paranoia in the other is controlling smart home devices remotely. An example could be flashing the lights, turning the speaker on and up to maximum volume or setting the smart thermostat to as high a temperature as possible. This can be emotionally damaging and stirs doubts over one’s sanity. In this scenario, again like the privacy issues, the answer is not to block the development of devices. Education is the best method to address the issue of smart home device abuse. The excessive monitoring through cameras is a relatively tricky problem to deal with as any negative abuse will have a less obvious action to it. Such an issue also should consider that the root problem is the desire to abuse rather than the tools that mediate it. Therefore some policy addressing the root problem is the way to deal with it. The security of smart home devices and their potential to exploit by criminals is something that needs to be dealt with too. As already discussed, the data gathered at home is the most sensitive and easily exploitable. Ultimately, the location of possessions and credit card numbers can be found out and put into the wrong hands. This problem could arise in a few different ways. The first is through the direct hacking, which can be illustrated from a recent case with Samsung SmartThings. Earlier this year, Samsung SmartThings was discovered to have many flaws in its security that a knowledgeable hacker could take advantage of. This problem has now been addressed with a firmware update, but prior to this it would be possible for a criminal to hack into your smart home ecosystem via your SmartThings. From there they could control any of your devices, including your smart locks, which would allow them to get into the home. Companies must take the steps to ensure their products are secure if they are taking on the responsibility of providing devices that could exploited. Generally, they are on top of it, but nonetheless at some point there will be some huge data thefts. The other scenario that sensitive data could be stolen is through second hand devices. A report recently identified a issues with first generation Amazon Echos design that could allow hardware modification that could send data to an external source. If it exists in one product such as the Echo, such loopholes will surely exist elsewhere too. The obvious solution here is educate and advise consumers to avoid second hand sales which are not certified refurbished. Smart home tech is new and many buyers are oblivious to risks like this. More information provision is needed to help protect consumer’s personal data. The issues discussed here are very much in their baby steps. It is positive that they are being observed and detected early so the right precautions and procedures can be developed to deal with the biggest issues. Essentially, what is needed is education on matters to prevent the exploitation of sensitive data and for tech firms to build up a relationship of trust with their customers and be held accountable for any exploitation. The speed at which this is happening is making it very tough for us to deal with. New concepts with new possibilities will always have both expected and some unexpected outcomes. The applications of smart home tech are truly amazing and will continue to be truly understood. The systems of today are relatively basic to the potential of tomorrow. There is a clear correlation between the sensitivity of the data and the potential quality of solutions that this tech could bring. For example, medical monitoring and automated responses could save lives and let the elderly live at home. But at the cost of the most personal data there is. The main problem that we are observing is the unauthorized collection of data that the devices are engaging in and sharing with third parties. Sharing sensitive data and personal information critically depends on the trust we have with those who gather it. Currently, this required level of trust is not being met.